I got this truck for Christmas before I turned 17. It was a full time 4x4, short bed, with automatic, 350, roll bar & brush guard. I added some round KC's on the roll bar, and some KC fog lights to the brush guard. I really liked this truck, but it did give me some problems. I had to have the engine replaced after about 6 months, and a 305 out of a Camaro was put in - big difference! This is the truck that got me interested in 4 wheeling, although most of what I did in it was just playing around on the farm. I really liked this truck, and wish I still had it. I sold this within a year, and my Toyota was purchased. The reason? I was planning to head out of state to college within a year, and I needed something more reliable. This was purchased after it was decided that off roading in the Toy - my main transportation - was not a good idea. We really got taken on this one, and paid WAY too much for a beat up Jeep. Still, it was a great learning experience to "live & learn" from. It had a 304 V8, 3 speed, stock everything except for some 31" all terrains. We replaced the rotten rear crossmember, installed new shackles, add-a-leaves, and poly bushings in the springs. This Jeep offered my first experience into the Model 20 two piece axle design - more than once. The thing had the sloppiest steering box, and was just shy of you-will-die dangerous on the road due to too much sway. So, we installed a sway bar (before I even cared about travel). Dad actually drove this CJ5 to Tellico from Nashville in some mighty cold weather - not a trip we wish to repeat! We eventually sold this CJ to an acquaintance for *almost* what we paid for it. Ahhh... my pretty little black CJ5. I really miss this one, as you can see it is pretty nice (I tend to own beat-up things if you haven't noticed). This one was my first real "deal" - we got it for $1200 in AL. It had a bad 304, but a good paint job, decent top, and some nice tires. 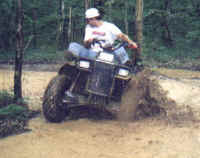 Soon after we purchased a red CJ5 for parts, and swapped the engine & chrome wheels to the black one. Again, it was set up with a 304, 3 speed, and stock axles. Of course, I also replaced a Model 20 two piece shaft in this one after spinning a rear hub. The 3" body lift made room for the 33x12.5 Mud Blasters, which were basically BFG M/T's. Hey, I know this isn't technically what you were thinking of when I said 4x4, but this thing is such a blast I had to mention it. I had grown up around 3 wheelers, go-carts, and motorcycles, but when I turned 20 I purchased my first 4 wheeler. I picked it up used, and have not stopped enjoying it since. It has had some rough times and break-downs (broken front CV in the pic - one not pulling), but that is mostly due to me slacking off on the routine maintenance. This thing really goes, and even has 25" tall mud tires! Hey, it even has a low range! Anyway, it is a blast, and the little lady loves riding it almost more than I do.